This is a book that has been getting a lot of press since it has been published, and has already been reviewed on the main Cannonball Read III blog, once by Carolyn and again by Even Stevens. These reviews are excellent, and I highly recommend them. The book is very well written and the story is fascinating. A few days after finishing reading, however, I do have some ideas and questions that are seemingly stuck in my head. When I earlier reviewed the most recent Mary Roach book, I recall some discussion about the appropriateness of the author including herself in the writing, which she has done in all her books. Given that she writes generally humorous books and uses her voice to highlight absurdity and wonder, and to demonstrate a human touch in what could be some pretty stark presentation of research, I think Roach’s approach is successful. I am less certain of that approach in Skloot’s book. While she generally uses a straightforward approach in discussing the science and ethics associated with the use of HeLa and other cell cultures, her presence is kind of overwhelming in relating the story of the Lacks children and her efforts to get the story. I understand she wants to really make their anguish and confusion palpable to the reader, and be honest about their experiences as she researched the book and tried to help them understand what had happened with Henrietta Lacks’ cells. 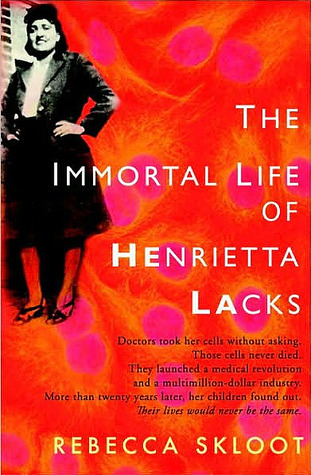 Perhaps I am thinking about it too much, but her repeated references to how she funded her research herself, how long it took to complete the book, and about repeatedly taking Deborah’s panicky phone calls (after calling the family repeatedly over years trying to set up interviews) feels a little off to me, more like a personal memoir rather than the story of Henrietta Lacks and her immortal cells (I note that Even Stevens felt differently about this topic). Another aspect of the story that has stuck with me is the sheer poverty of the Lacks family and the struggles they have gone through. In some ways, I am reminded a bit of Jeanette Walls’ The Glass Castle. Although close family members grew up in similar circumstances and knowing people still live and raise families with those difficulties, it makes me really sad that North Americans, with all the resources that should be available, still grow up without adequate medical care, education, and social supports. Also, the book reminded me again of how heartbreaking the American medical system is for people without insurance or money. It makes me very grateful to live in Canada; nobody here would get a bill for over $100,000 for heart bypass surgery, as does Sonny Lacks. This was a thought provoking and compelling book, and despite my reservations about Skloot’s presence in the story, I look forward to reading more of her work in the future.